Read about some energy-saving choices for home lighting. With all due respect to Thomas Edison, the life of the incandescent light bulb may be coming to an end. Knowing the best ways to use new energy efficient light bulbs can lead to substantial savings on the cost of lighting your home. Watt: This is a standard international unit of energy; a 60-watt incandescent bulb draws 60 watts of energy to operate. Lumen: This is a standard international measurement of light produced (the visible product of the process measured in watts). Most light-bulb packages will tell you both the number of watts and the number of lumens. You can evaluate your possible energy savings by comparing these numbers on the package of an incandescent bulb. The fewer the watts needed to produce the lumens you want, the more efficient your energy-efficient light bulb will be. Manufacturers recommend that, to get the same amount of light as the bulb you are replacing, match lumens to lumens rather than trying to remember all the wattage equivalents. CFLs currently offer the greatest variety of bulbs: spiral bulbs, three-loop bulbs, covered three-loops and small-base bulbs suitable for candelabra and ceiling fans. Special bulbs have been designed for three-way lamps and dimmer-switches. Early CFLs disappointed customers with a cold office-like light; CFLs now provide a warmer glow. One energy-information source calculates that if every household replaced its five most frequently-used bulbs (main fixtures or lamps in the living room, family room or den, kitchen and porch light), energy savings would amount to nearly $8 billion a year and cut greenhouse gases equaling emissions from approximately 10-million cars. Energy savings are substantial, between 50 and 80 percent per bulb. A CFL drawing 22 watts produces the same lumens as a 100-watt incandescent bulb. There are several situations unsuitable for CFLs. The bulbs are not as efficient as they could be in a fixture that is frequently turned on and off. Bulbs used in outdoor fixtures need protection from the elements to maintain efficiency. Very shallow sconces and ceiling fixtures may not accommodate the comparatively wider base of a CFL, and lamps with clip-on shades will need to be replaced. 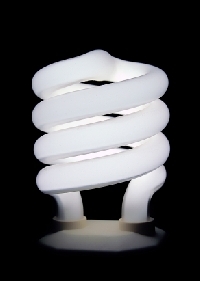 Breakage is a concern with CFLs; like incandescent bulbs, they contain mercury. One manufacturer points out that the amount of mercury in a bulb is roughly one fifth of the mercury in a watch battery. Another source points to the mercury emitted by a coal-fired power plant, suggesting that using less energy can mean reducing power plants. In case of breakage, manufacturers suggest calling the local recycling center to determine proper disposal. CFLs are designed to last up to 10 times the life of an incandescent, which is calculated as 750 to 1,000 hours. LEDs offer even longer durability, estimated at 10 times that of a CFL and 133 times that of an incandescent. Manufacturers estimate batteries in small LED devices like flashlights can last 10 to 15 times as long because of the low wattage drawn. LEDs are solid with no filament, reducing concerns about breakage in either indoor or outdoor use like street lighting and traffic lights where energy savings are estimated as high as 80 percent. The low-wattage draw suggests their potential in remote areas, where solar panels rather than power lines or generators can provide adequate, less-costly power. LED light is very focused, making it suitable for reading lights and spotlights. Anyone who bought LED Christmas lights this year may have found they looked like brightly-colored dots and dashes in the dark, instead of colored ovals. New designs that cluster LEDs expand the light field, suggesting more possible indoor uses. LED flashlights, already commercially available, use clustering that makes them look rather like ice-cream cones. LEDs are available in colors; red and green are used for military night-vision devices. Senior citizens, asked to try out prototype reading lamps, reported less eyestrain from blue LED light than from white-light sources. Halogen lights, expanding incandescent technology (tungsten gas heated by a metal filament) with halogen-family gases (krypton, xenon or argon), offer some energy efficiency, estimated at 10 to 20 percent over incandescent bulbs. Halogen bulbs increasingly power car headlights. Bulbs burn very hot, so caution should be used in deciding where they are safe. Calculating the exact savings produced by energy-efficient light bulbs in your home means taking several factors into consideration: watts, lumens, bulb cost and bulb life. Most important, however, is recognizing that new technologies make it possible to save both money and natural resources.